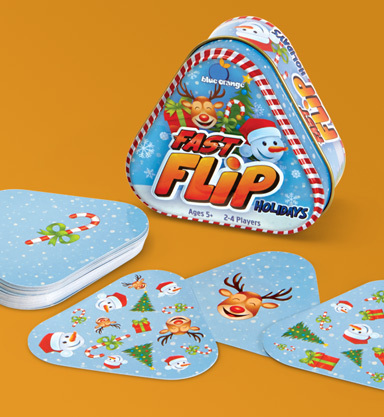 Experience Fast Flip with five new cheery images to inspire the holiday spirit! 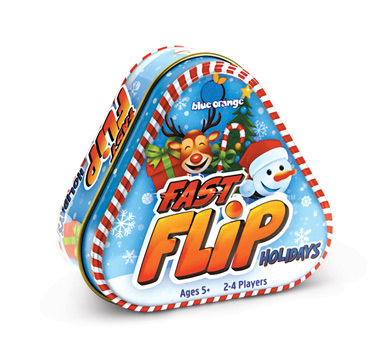 Fast Flip Holidays is a clever high speed matching card game packed in an adorable tin perfect for stocking stuffers and for traveling to visit relatives. Flip a card and match a holiday symbol to a number or a number to a holiday symbol. Reindeer, presents, candy canes, Christmas trees, and snowmen bring holiday cheer to this twist on a Blue Orange original. Fast Flip magic guarantees only one answer between any two cards!